The USAG Bavaria Garrison Commander, Col. Lance Varney, will host a community town hall Tue. March 28 from 10 to 11:30 a.m. at the Tower View Conference Center, Bldg. 209 at the corner of Wilbur Rd. 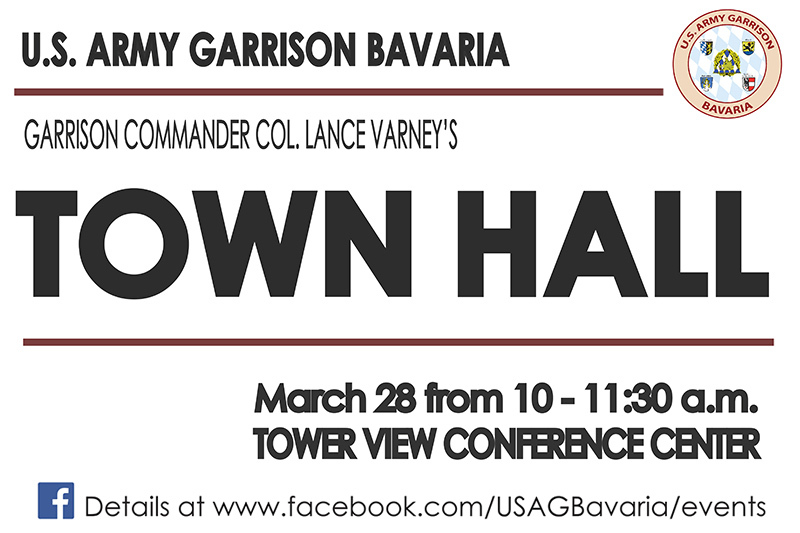 and Argonne Ave.
GRAFENWOEHR, Germany — The USAG Bavaria Garrison Commander, Col. Lance Varney, will host a community town hall Tuesday, March 28 from 10 to 11:30 a.m. at the Tower View Conference Center, Bldg. 209 at the corner of Wilbur Rd. and Argonne Ave.
USAG Bavaria exists to ensure the life, health and safety of the community. Through this town hall, garrison leadership wants to connect, inform and empower community members. All members of the USAG Bavaria community are invited to attend to ask questions and voice their concerns on any garrison topic. Questions are being accepted, until Wednesday, March 22, by email at usarmy.bavaria.id-europe.mbx.pao@mail.mil and under the event tab on USAG Bavaria’s facebook page for people unable to attend the event in person.